Did you go out shopping for Black Friday? I sure didn't I slept in and laid in bed watching tv. I love having off for the Holidays :) I've pretty much finished my Christmas shopping too except for a few gift cards that I'll be picking up today. 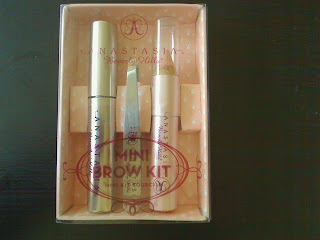 Speaking of gifts, I have the perfect idea for a stocking stuffer...the Anastasia Mini Brow Kit. It retails for $25 and can be purchased from Sephora. The kit includes a pair of mini tweezer, a mini brow gel, and a mini matte camille highlighter (love this!). This is also perfect for traveling. Just pop it in your makeup bag and you're good to go! 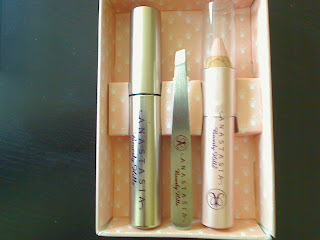 The mini kit is also great if you wanted to try Anastasia products for the first time. 1) Begin by tweezing the eyebrows with the tweezers. 2) Apply the pencil above and below the eyebrow and blend. This will give the illusion of a perfect eyebrow shape. 3) Finish up by allowing brow gel to keep hairs in place. -Mini size makes it easy to travel with. -Great price for all 3. -This highlighter looks good on all skin tones...I use it on all my clients. -The tweezers are callibrated just like the originals and designed not to break the brow hair. -Looks so tiny and cute! The only con is that you need to make sure to hold the tweezer closer to the slanted egde. That way, it's easier to close and open the tweezers. Since it's a mini tweezer, there's less room so you have to put a little more strength into it. Check these out at Sephora. Is the tweezer as good as Tweezerman? i really want the brow fix pencil gel.. can u do a swatches or a lil tutorial on ur brows pleease =) all i got for black friday was electronic stuff from my bf haha but he doesnt wanna buy me other things unless i really need it.. booo! !